Russian President, Dmitry Medvedev, has ordered the federal government not to fulfill the gas transit protocol until Ukraine drops certain clauses to the document which have not been agreed with Moscow. Foreign Minister Sergei Lavrov informed Dmitry Medvedev that the protocol on international monitoring which RUSSIA and the EU signed on Saturday was signed by Ukraine, but along with the signature, Ukraine provided a certain declaration of amendments. Lavrov said those amendments stipulated Ukraine did not syphon off any gas going to Europe, and “half of it contradicts the document Russia signed with the EU”. 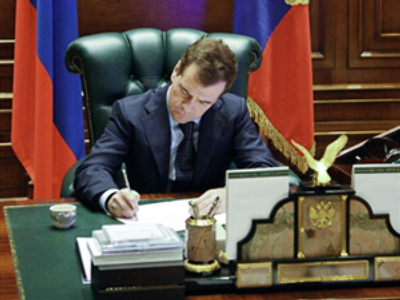 Medvedev called the amendments a mockery of common sense and a violation of earlier agreements. “Those who signed the agreement adding some amendments should realize that this document is invalid. That is why I order the government not to fulfill the agreement with the EU signed on Saturday. I ask you Mr Foreign Minister to inform our European colleagues that they find themselves in a very difficult situation. After the Presidents comments, and speaking on German TV, Russian prime Minister Vladimir Putin outlined the cost to Gapzrom of the dispute.